With the success of E-Go and E-Go2 long boards, Yuneec has launched yet another affordable skateboard that is expected to perform much better than its predecessors. This brand-new Yuneec E-Go Cruiser long board offers a great build, along with a power packed performance output. Although Yuneec’s previous models were geared towards kids or teenagers, this E-Go Cruiser is aimed at semi-professional adult riders. This means that adults who like to ride skateboards whenever they leave the house will find this product extremely useful. This model is made with persistent use in mind, so its structure and build are quite durable in nature. In addition to that, Yuneec E-Go Cruiser offers a well-suited maneuverability option with its brushless DC motor and intelligent drive system. Is Yuneec E-Go Cruiser worth the cost? Color Options 1 – Orange Black. There are several unique design elements that have been added to Yuneec E-Go Cruiser in order to make it appealing to riders. Its Lithium ion battery and DC motor is tucked very sleekly underneath the deck. This makes for a smooth ride along the jagged roads, as the center of gravity of the skateboard is significantly lowered. You would barely see the underbelly of the board where the battery and motor is located. Its deck is made up of 8 separate layers of Canadian Maple Wood. This provides a guaranteed flex and durability improvement in the skateboard, thus making it quite sturdy and extensively strong. Its sturdy construction does not take away its flexibility – as this classic longboard provides a better grip tape when compared to most other long boards in this price range. As far as the range and speed specifications of Yuneec E-Go Cruiser are concerned, one can easily say that it has the best ratings when it comes to this price point. This skateboard has the perfect balance of speed and range, clocking at a max speed of 12. 4 MPH. Its lightweight construction enables riders to take long distance commutes without worrying about its range. Its Lithium ion battery charges quite fast, in just under 4 hours. Along with it, the 90 mm x 52 mm polyurethane wheels deliver sophisticated power and maximum traction while using this skateboard. Yuneec E-Go Cruiser has 2 different acceleration settings, namely Eco mode and Sport mode, which enables the rider to control the torque settings of its DC motor. In addition to that, this model also features 2 separate modes for top speed. At the faster “Rabbit” mode, it can deliver a top speed of 20 km/hr. or 12.42 MPH. 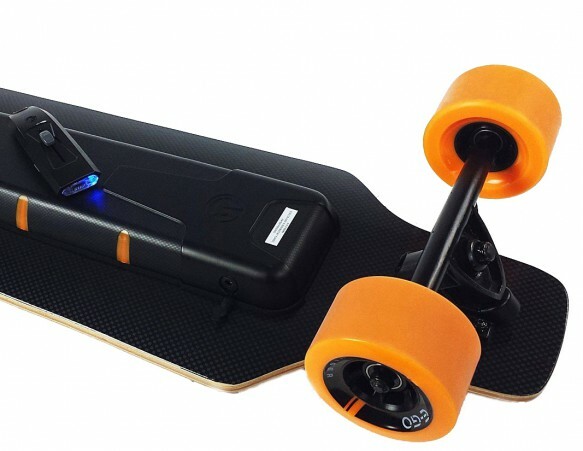 While in its slower “Turtle” mode, this skateboard can deliver up to 13 km/hr. or around 8 MPH. Its max user load is 260 lbs. but exceeding that weight limit would not impact the strength and durability of the board. Rather, its top speed and range is a bit compromised. This skateboard has an integrated USB port available at the bottom of the board. It provides hassle-free charging, with minimum energy loss. Its orange 840C wheels are not too hard so that it can cushion cracks or bumps along the road. This enables a smoother experience for the rider while riding this skateboard. Charging is made quite easy, but conserving your board’s electric charge is made much better with the introduction of regenerative braking, which conserves charge every time you press the brakes. The Yuneec E-Go Cruiser provides an excellent balance between price and quality. It is one of the most affordable longboards in the market, and its impressive spec sheet speaks highly of its amazing features. It has a dedicated app for iOS users where you can switch between ride modes and check your travel statistics. In addition to that, it also comes with a remote control that enables smooth control over your skateboarded. So, if you are waiting to get a decent skateboard with durable construction, then this is the best choice for you!